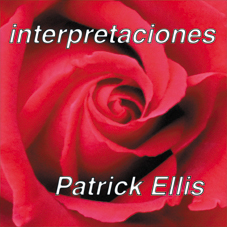 Patrick's new CD 'Interpretaciones' is a tribute to some of the great composers of the tango canon. Composers whose music has filtered into the blood and sinew of Argentina and which is now reaching out across the world. Composers whose work consistently resonates wherever tango is sung or danced. Composers such as Radrizzani, Demare and Troilo - not forgetting the great innovator Astor Piazzolla. 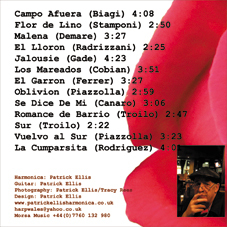 Featuring 12 tracks on chromatic harmonica and accompanied by a nylon string guitar, 'Interpretaciones' is available from Patrick for the princely (or princessly) sum of £10 (+ p&p).